Crafted from the finest grade wood, our offered wooden charpoy is known for its sturdy structure, seamless finish, weight bearing capacity, long life span, and reliability. We offer the same in various size to meet the ever-evolving market demands. Operating from Rajkot, we are capable of meeting all sorts of national and international requirements. 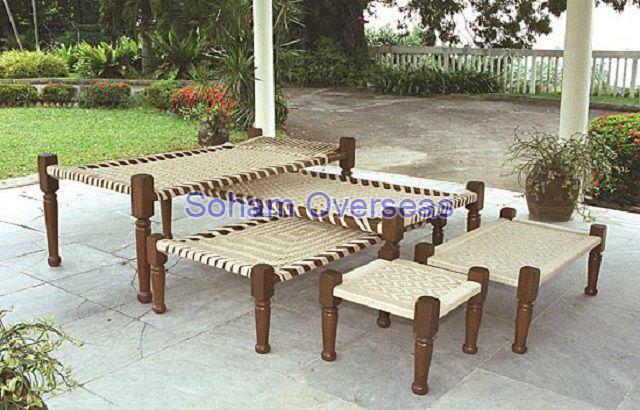 We enjoy a great demand for this product from various industrial units, hotels, restaurants, dhabas, and households. We are well-equipped with enough capacity to satiate the ever-scaling demands of the market on a timely basis. We pack it firmly with quality packaging, to avoid the chances of damages during the transit or storage. Being recognised as a major wooden charpoy supplier in Rajkot, we strive to maximize client satisfaction in every possible way.